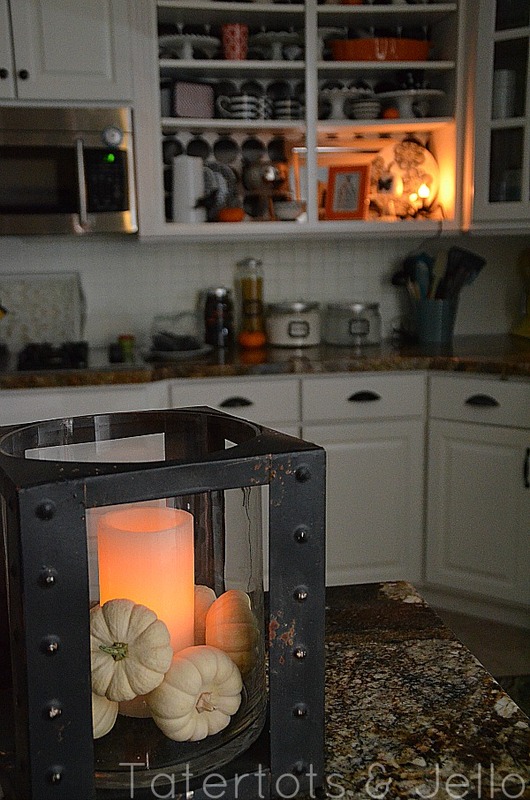 You might not have a mantel to decorate for Fall, but you can find a little space in your home for festive decor. When we finished our kitchen remodel last year I left a couple of doors off of a cabinet next to my sink. 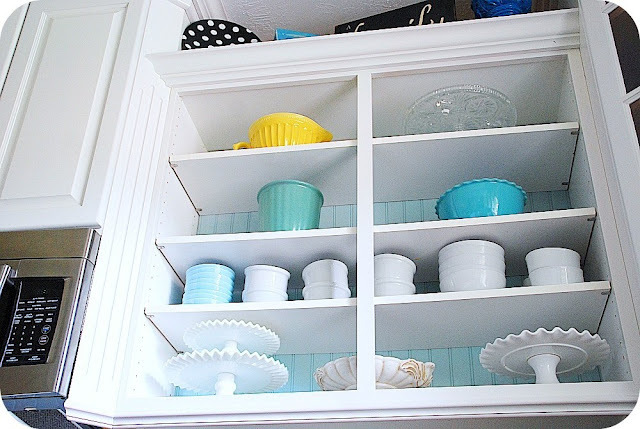 I cut and painted a square of beadboard to go in the back of the cabinet the same color as my island — it was a fun little area to display pretty dishes, cake plates and bowls. 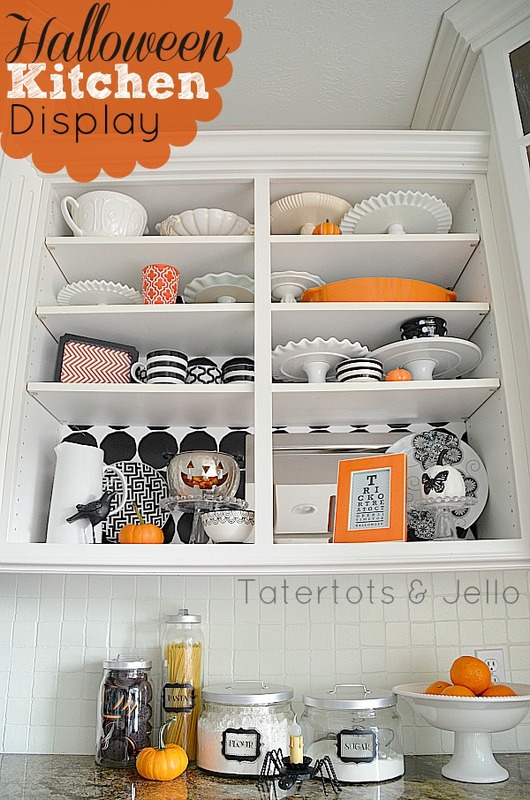 For this Halloween idea, I scrounged around and found everything I could that was orange to display — including this orange casserole dish that was hiding in one of my cabinets. I think it looks so festive on display. I found some wrapping paper and wrapped it around the beadboard. Then I put the board in the back of the cabinet, with the shelves in front. 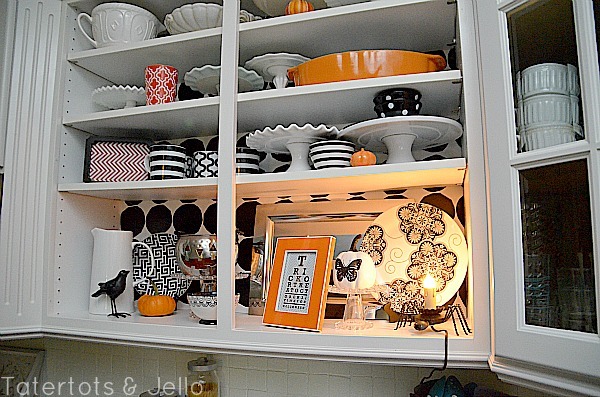 The wrapping paper changes up the whole look of the cabinet — adding a spooky element. 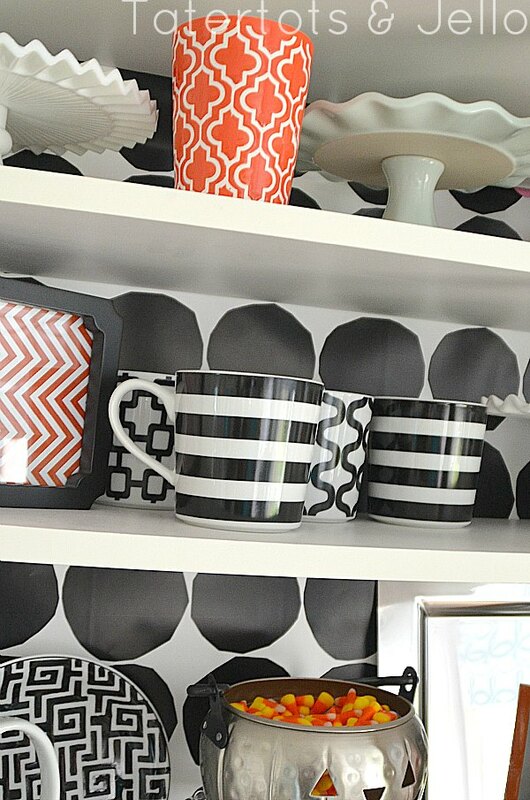 I put the same cake plates back in the shelf, along with some graphic mugs I picked up at Crate & Barrel, some pretty striped and polka-dotted bowls from TJ Maxx and a couple black and white plates. 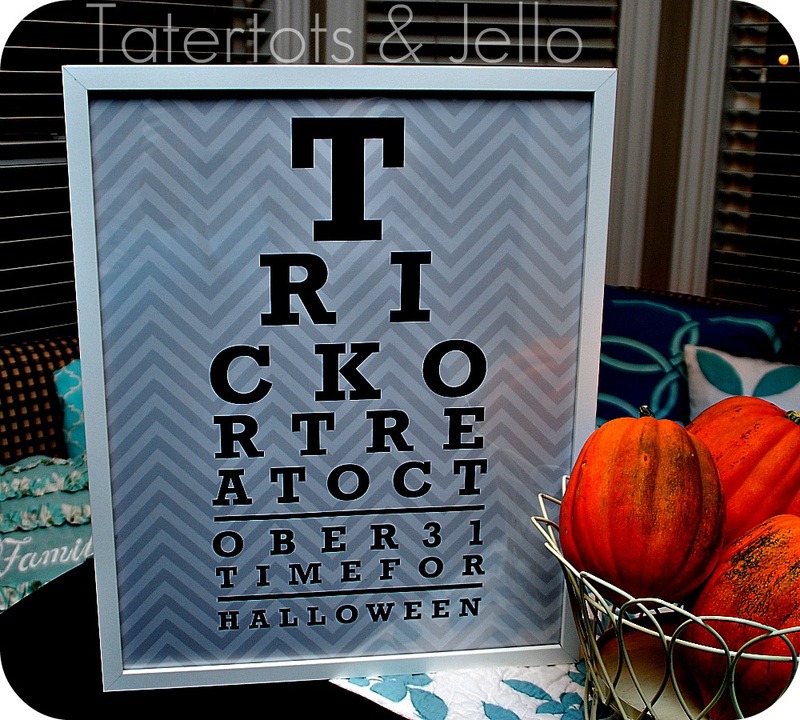 I also took the Halloween Eye Chart printable I made last year and tweaked it alittle for 2012. I made the design a little bolder and then I framed it in a modern orange frame. I also took the orange pattern and made that bolder and framed it in a cheap black frame. I also added a little modern element with some silver accents. 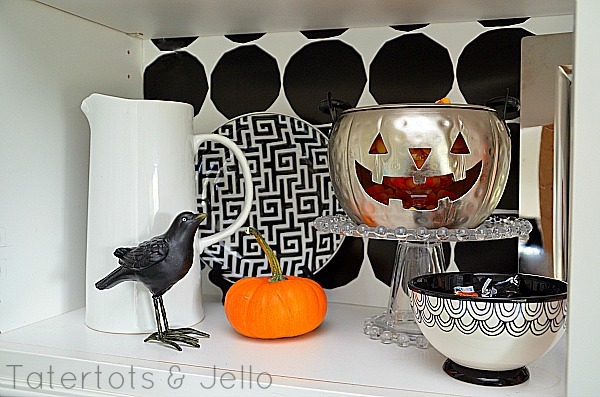 I found a silver pumpkin at TJ Maxx as well as a silver tray from Target. I love the way they shine. And I reused a small spider light I bought many years ago, and on a whim I added it to the bottom shelf of the display — I love the way it looks all lit up at night. So cozy. I also think it’s great that I can take the wrapping paper off after Halloween and add a different wrapping paper for Thanksgiving or Christmas and easily change up the look. 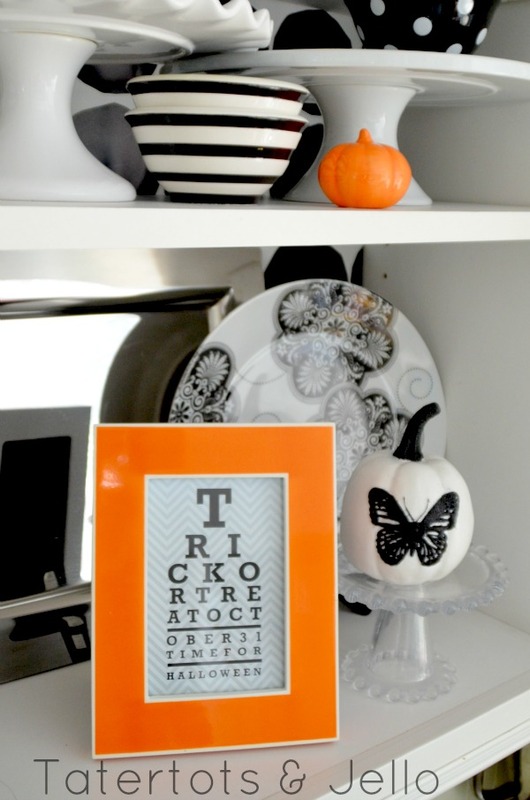 Here are four new printable pages, updated from last year’s Halloween Eye Chart project! These are the printouts I used in this year’s display. I’ve included them as a PDF since you will likely not print them at a commercial photo printer (like Costco). In this PDF, you’ll find four pages total: two pages of two different shades of orange chevron, a black/grey/white eye chart with darker chevron than last year, and then a blank page of the same grey on grey chevron pattern. You can choose between Orange or Grey. PLUS, I have also included a way to print these off BIG!! Here is a link to the .JPEG files — so you can send these down to Costco or similar and get them printed out in a BIG size!! The one I printed fits PERFECTLY in an Ikea 19 3/4 x 15 1/2 frame (IKEA Ribba (200.783.33)). You can send the file down to Costco and they can print it up THE SAME DAY. It cost $6 to print!!! Here’s the full collection of PDF printables, hosted on Scribd. Just click the download button to download the PDF. If you’re going to print these at Costco or some other photo processing shop, you might prefer to use the .JPG or .PNG files, linked below the Scribd files. Note that there are five (5!) versions. The first is a “fancy” version that includes all of the classic eye chart numbers and frippery. The two 8.5 x 11 ones are above, and here’s the PDF version of the “fancy” one in 8.5 x 11. After that I’ve linked all the sizes in PDF, JPG and PNG. If you’re planning to print these at Costco or another photo printing place, I recommend you use these JPG files. Warning: they’re huge files, especially the ones for the large frames. And if the JPG files aren’t working for you, you can also use these PNG file links instead. Warning: they’re fairly large files, especially the ones for the large frames. 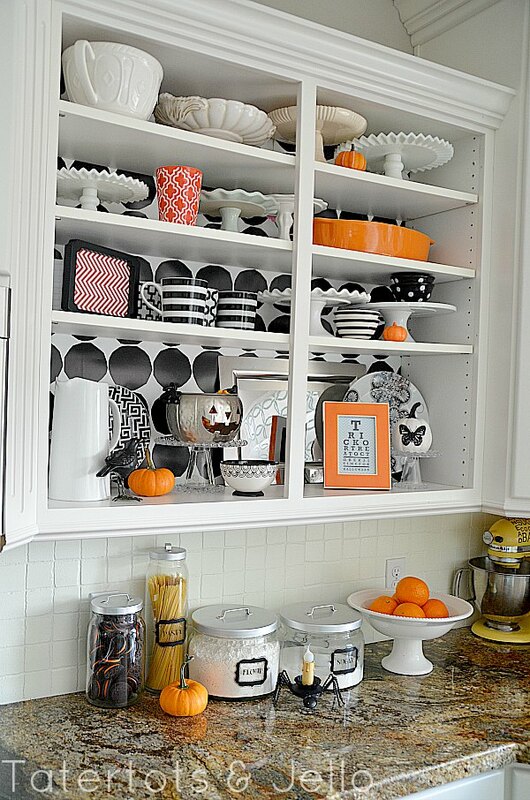 Do YOU have an area in your home that you love to decorate for the holidays?
? I would love to see YOUR ideas — leave me your ideas and links in the comments. FOUR Printable Halloween Gift Tags! 10 Fabulous Fireplace Before and After Projects! Three Free Printables and DIY Upcycled Shelving Art Tutorial! Hi i am still curious on how to make the Halloween wreath! i wanna come over to your house & play in your kitchen! so fun! Jen, I have the same white cabinets in my kitchen & have been wanting to take off the doors and put a pop of color in the back. This post makes it a must do! 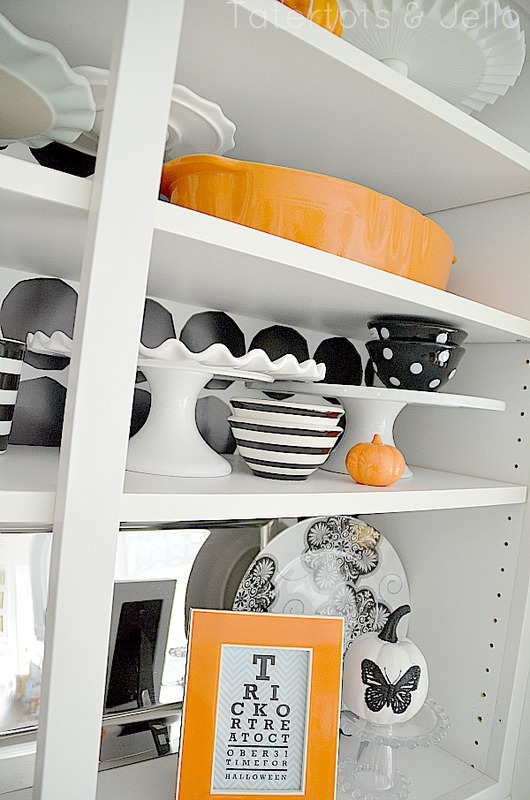 I also love to decorate with simple seasonal colors. Thanks for the inspiration! Jen, are those labels on your flour and sugar canisters? If so, where did you get them? That display is so fun! 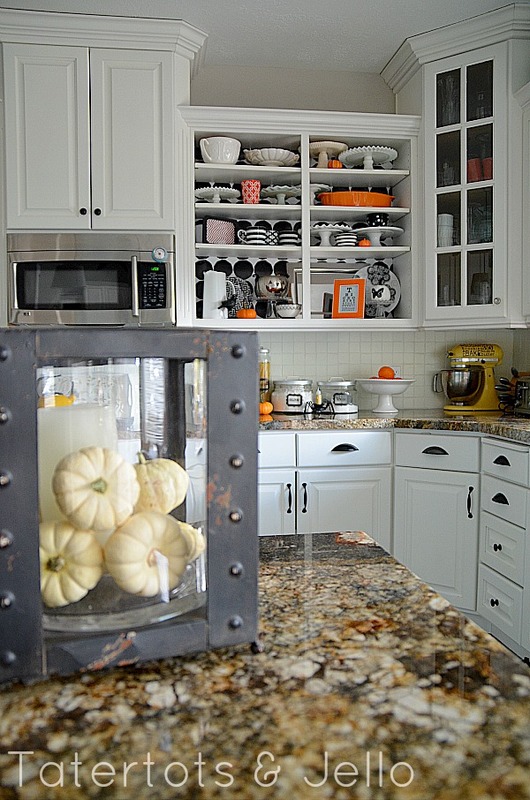 I love the idea of decorating a shelf in the kitchen, spaces like that are easy to overlook when decorating. This is so cute! I love it so much! I am definitely printing one of these eye charts to use on my shelves. Super cute!! 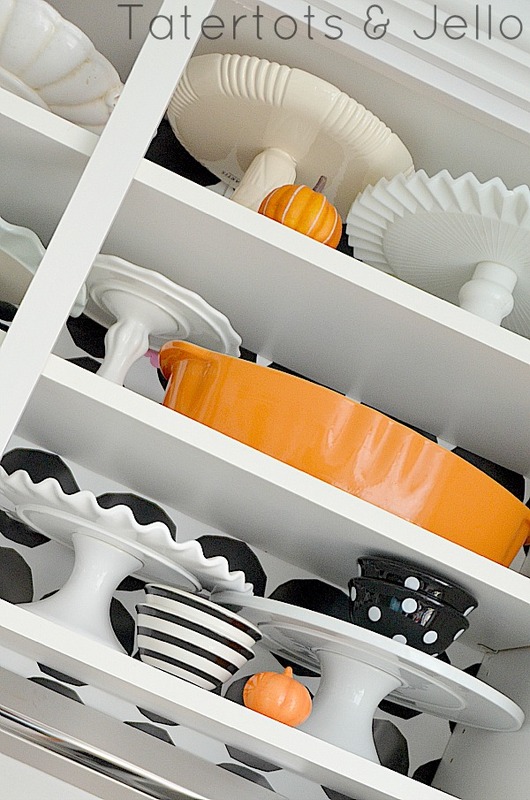 I love what you’ve done with your shelves- so fun! And I’m going to use the printable too! Thanks so much! oh Jen I’m SO jealous! I LOVE this!!! thanks for the printables too!! Thanks Cheryl!! I keep thinking I’m done decorating and then think of another idea lol. Have a great day my friend!